iPhone 3G Coverage Complaint Maps - New! With all of the excitement of the iPhone and 3G there are issues with the technology that may require further investment by carriers in infrastructure to provide seamless coverage. 3G technology operates at higher radio frequencies than earliest 2G systems and does not penetrate inside buildings as effectively. 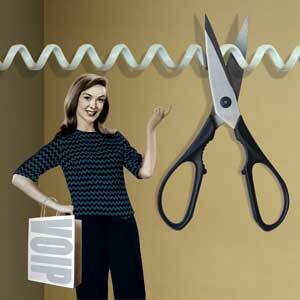 Voice quality may suffer and data rates are often much reduced. DeadCellZones.com has launched a coverage complaint map that is optimized on the iPhone to when you are away from your computer. https://iphone.deadcellzones.com Type in your zip code, city and address to search for other complaints in the area. Add your comments on the coverage problem whether you are indoors and the type of device you are using to help carriers better understand how to solve the problems in the neighborhood. It is no surprise that consumers are becoming increasingly dependant on their mobile phones. Whether they’re checking email, downloading videos, or making a call, users rely on these devices to stay connected. CTIA Wireless Association estimates that there are 267 million cellular subscribers within the U.S., giving cellular phones more than an 85 percent market penetration. As the cellular market grows, traditional landlines are going the way of the dinosaurs. One reason is the tightening U.S. economy. As budgets tighten, consumers are looking for ways to cut their spending and are beginning to see their landlines as a quick way to cut costs. According to the Nielsen Company, more than 20 million U.S. telephone households (17 percent) rely solely on a mobile phone for their home telecommunications. Despite the growing dependence on cellular phones, infrastructure issues still exist and cellular reception woes plague users across the country. Surprisingly, reception problems are no longer an issue reserved for sparsely-populated, wide-open areas of the country. Dropped calls and reception issues exist from the streets of New York to the deserts of Arizona. 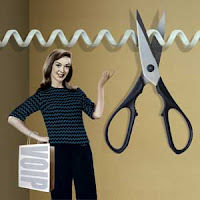 As consumers look to cut the cord, they need to be able to trust that their cellular devices will keep them connected. This includes selecting the right tools that enable them to make or maintain a strong data connection. There are several tools for consumers to consider, including cellular signal amplifiers and femtocells. Femtocell users, however, should consider the significant technology limitations of this technology including user subscription fees, single-carrier access, and the necessity for a high-speed Internet connection (See the contributed post on femtocells). Cellular amplifiers (such as those manufactured by Wilson Electronics) do not require a subscriber fee or an Internet connection, they fully support multiple carriers on multi-frequency bands, and are available in both mobile and in-building configurations. These devices enable users to reduce dropped calls and improve performance for mobile phones and laptop data cards, allowing users to trust that their cellular device will always keep them within reach. Contributed Blog – As dependence on cellular devices increase, what about signal integrity? AT&T is following in Sprint's footsteps by experimenting with in-home mini cell phone tower what they have branded the Microcell, otherwise known as femtocells. Sprint has been selling its own under the Airave brand. Femtocells are made to boost the cell phone signal via your high-speed Internet connection; think of it as your very own cell tower. This is great for consumers who are unable to boost a weak signal with repeaters and have zero bars of coverage outside their home. However, one possible limitation as these new personalized cell phone towers roll out is the possibility for interference with your neighbor who might have good coverage already. Your neighbor might not be happy with you if you start interfering with his coverage network. I think it is going to be critical for carriers to do their research on their own perceived coverage as well as their competitors in certain areas before they start offering these products to the masses. We have plenty of cell phone coverage complaints in our database for carriers to analyze when making decisions about regions to target. Lets just hope they all start paying attention to what their customer is saying. 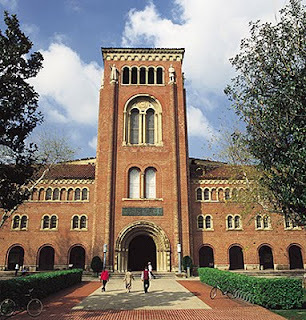 How is your cell phone coverage on campus? We are are beginning an aggressive marketing campaign to help identify coverage problems at colleges and universities throughout the U.S. Our goal is to identify campuses with particularly bad coverage problems and regularly highlight these campuses on our maps. Indoor and outdoor coverage problems should be identified on our maps if you cannot send or receive phone calls. Just put a pin in our map if you have an annoying location that you would like to see improved. The carriers are watching so your efforts will not go unnoticed. Please email your friends on campus and put a pin in our map! Below is a map of USC in downtown Los Angeles that appears to be pretty good minus the one Verizon complaint. 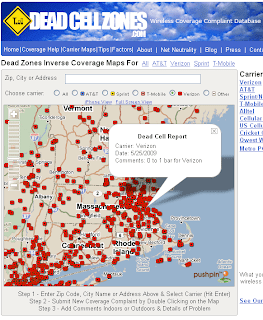 DeadCellZones.com has launched a new full screen version of our coverage maps after receiving number of requests from cell phone retailers around the U.S. who are going to start using our maps in stores. Our maps a designed to "help consumers help carriers" prioritize coverage upgrades by communicating problem areas more effectively. Now that our maps have a critical mass of data points (27,000+ locations) and growing consumers are finding the information valuable to share and make better decisions about which carrier to choose. See the regional map below of Palos Verdes, California mobile phone retailers use in Southern California. Companies like Root Wireless crowdsources signal strength and allows consumers to kind of view.